First Ukrainian fashion brand ANNA MORGUN that won the hearts of the most demanding emirati fashionista and celebrities will launch HAUTE COUTURE collection. KYIV, Украина, December 29, 2018 /EINPresswire.com/ — ANNA MORGUN has become one of the first Ukrainian fashion designers who got overwhelming success among emirati fashionista and doesn’t lose her positions until nova days continuing to delight with new collections her most demanding clients. This season Creative Director and Founder of the brand prepared one more terrific statement and announced about launch of the first 20 piece HAUTE COUTURE collection by ANNA MORGUN that will be represented next spring in Dubai. “I’m blessed and very grateful to Dubai and UAE citizens for their love to my creations. The biggest joy to every fashion designer is to see satisfied eyes of the client when she clothe your dress, that’s why I am as a creative director feel a great responsibility to make these eyes shine brighter. For the past years we’ve been working with many celebrities and tastes of our chosen ones becoming more and more demanding so it makes a sense that the question about creation HAUTE COUTURE is just a matter of time.” designer Comments. First HAUTE COUTURE collection by ANNA MORGUN will see the world in April 2019. 20 pieces of exclusive dresses with handmade embroidery in combination with luxurious fabrics is already been developing in private studious of the brand in Dubai and Kyiv under the strict secret. Brand representatives promise unforgettable show and totally new ANNA MORGUN. “The brand exists since 2014, I could never believe that one day I will have a possibility to work with HAUTE COUTURE. This is totally new experience for me as for the fashion designer and a new challenge, because I feel all the responsibility to all our clients. But meantime I’m very happy and grateful to emirati ladies for their choice and inspiration that they give to me as to the creator.” added designer. Mark Russo, Founder of TIC with Casey Powell, CEO will be attending the 2019 Safari Club International Annual Convention in Reno, NV Jan 9-12. BATTLE GROUND, WASHINGTON, UNITED STATES, December 28, 2018 /EINPresswire.com/ — Treasure Investments Corporation (TIC) will be setting up a 20’ X 30’ booth display, larger than last year’s 20’ X 20’. TIC will have on display over 50 bronze and pure silver castings, including a larger than life bronze sculpture of two fighting elk standing over 10’ tall, 20’ in length, and weighing over 3,000 pounds. 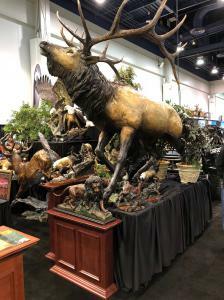 Also, on display will be a single life-size bronze elk, two sets of life-size bronze eagles, a life-size bronze of a whitetail deer and over 5,000 ounces of pure silver pieces. The silver castings will include a 1,000 troy ounce silver elephant, 1,000 troy ounce silver lion, bull and bear, 1,000 troy ounce silver eagle and pure silver rhino. “We have an amazing location this year and are very excited to attend. The safari club event is always our favorite and the most fun. Having all the monuments and pure silver pieces should create a good draw for us,” says Russo. 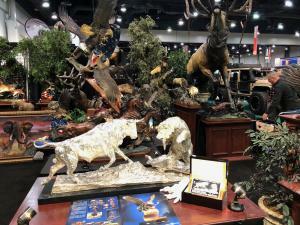 Safari Club International is the world’s largest hunting and sporting exposition. The annual convention draws nearly 50,000 people from all over the world. 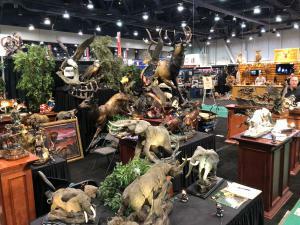 Safari Club International is not like your normal sportsman shows. Tickets to walk through the doors are over $150.00 each per person, and that’s just to see the booths and exhibits. Clients of the show often spend tens of thousands on goods and products, in some cases people will pay millions of dollars at the show. The Safari Club conference will be the first show of the year for Treasure Investments Corporation. The company plans to attend additional conferences throughout the year. “We are very excited to show off all our newest creations including Stage Coach Gold, a 1/10 scale bronze 1860s Concord stagecoach with a six-horse team created by Laran Ghiglieri, it’s amazing,” says Russo. TIC has a diverse business platform, creating and providing fine art in original sculptures from small desktop images and collectibles to larger-than-life heroic monuments. The company’s master mold collection contains hundreds of original molds from world-famous artists in the United States and Europe. For more information, visit Fineart1.com. 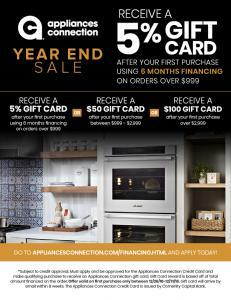 BROOKLYN, NY, USA, December 27, 2018 /EINPresswire.com/ — Appliances Connection is your destination for the most competitive prices on home goods all year round. However, you'll have even more incentive to buy at our 2018 End of Year sale. You'll find up to 65% off select items sitewide. Not only that, you'll have access to exclusive deals such as a free appliance with qualifying purchase, instant savings, mail-in rebates, and so much more. You don't have to wait for the new year to get the new kitchen look you've been wanting. 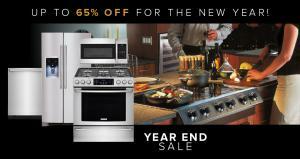 Purchase now and you'll find unbelievable savings on ranges, refrigerators, cooktops, wall ovens, dishwashers, and small appliances. We carry products offered by every major brand from dependable favorites like Frigidaire, Electrolux, GE, and Samsung to the ultimate in luxury including La Cornue, Bertazzoni, SMEG, Sub-Zero/Wolf, and Monogram. Appliances Connection isn't just there for you in the kitchen. We'll make laundry a breeze with washers and dryers from brands such as Bosche, Fisher & Paykel, Whirlpool, and Miele. If your goal is to change of the decor of your entire home, we're there for you. Check out bedroom sets, living room sets, and dining room sets from the finest furniture manufacturers like VIG, Manhattan Comfort, TOV, Modway, and Milo Italia. At Appliances Connection, we know that buying home goods of this caliber is a major investment. That’s why we make the experience as easy and painless as possible. Working for us is a veritable army of expert salespeople, skilled shipping specialists, and experienced customer service representatives. We’re here to help you every step of the way – from choosing the best items that suit your needs and tastes, meticulous delivery, and dedicated after-purchase assistance for the life of the product. When you buy luxury home goods from Appliances Connection, we’ve got you covered. *You may only choose one reward with your first purchase. Offers cannot be combined. Click on the picture in the upper right of this page for further terms and conditions. Seat Covers Unlimited announces the sale of their truck bed seat covers and truck seat covers on Amazon Prime with free two-day shipping for Prime members. MESA, AZ, UNITED STATES, December 27, 2018 /EINPresswire.com/ — Amazon Prime members can now buy truck bed seat covers from one of the most trusted seat covers retailers in the United States. Seat Covers Unlimited announced in December that it will be selling universal truck seat covers on Amazon with select options available for Amazon Prime free two-day shipping benefits. "Expanding our selection on Amazon Prime makes it more convenient for Prime members to purchase our seat covers since they can combine the order with other items they need," said Matt Larsen, the e-Commerce manager at Seat Covers Unlimited. "The fast and free shipping for Amazon Prime customers helps our customers save even more money on our already affordable truck bench seat covers." Seat Covers Unlimited is the world's largest online retailer of custom and universal truck seat covers. Shoppers can customize seat covers with their vast selection of fabrics, colors, patterns, and more. With unlimited seat cover options for most vehicle makes and models dating back to the 1930s available, buyers can create truly unique seat covers to meet their needs. Choose between waterproof fabrics, neoprene, faux fur and leather, canvas, patterns such as animal print, florals, and camo, and a broad range of colors. SCU's universal truck seat covers are designed to fit bucket and bench seats in most makes and models of trucks, including familiar brands like: Ford, Chevy, Nissan, and Dodge. Buyers can search by truck make and model to find the seat covers they need. Seat Covers Unlimited truck seat covers are not limited to Amazon Prime members. Non-Prime amazon shoppers can purchase the popular truck bed seat covers on Amazon or on their website but will not enjoy Prime's free, two-day shipping; However, affordable shipping prices are still available. With SCU on Amazon Prime, the product returns process is quick and easy. Because customers don’t have a chance to preview their seat covers in person before purchase, it is not rare for buyers to exchange seat covers after ordering the wrong item, size, or a color that didn't meet their expectations. "We are dedicated to providing the best quality products and the highest level of customer service," Larsen said. "We are glad to make returns, for any reason, quickly and efficiently. Our customers are often ecstatic by the look and quality of their truck seat covers." Hundreds of positive reviews on Amazon and other areas around the web testify to the product quality of the seat covers offered by Seat Covers Unlimited. Many customer testimonials also compliment the service quality received by the company. Amazon carries more than 20,000 products from Seat Covers Unlimited, but Amazon Prime members have a more limited selection. The company plans to extend its offerings available for Prime members in the near future. To find SCU seat covers, just search for Seat Covers Unlimited on Amazon. The seat covers are also available on the company’s online store at www.seatcoversunlimited.com. For more information, call toll-free at 888-410-5050. FlowerKisser After Midnight English Lavender is the 2019 Plant of the Year from High Country Gardens. 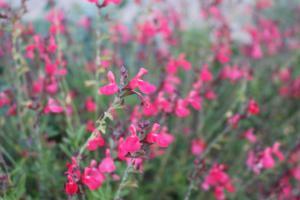 The brilliant flowers of FlowerKisser Coral-Pink Sage bloom from late spring to fall frost. The Fabulous Flowers and Foliage Shade Garden is an easy-to-grow pre-planned garden that includes 18 plants and a planting diagram. 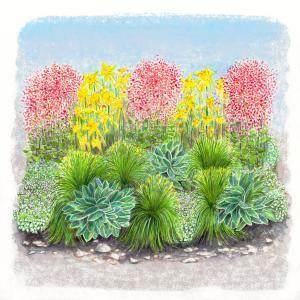 High Country Gardens, a top online source for plants that thrive in even the most challenging conditions, has announced its top new perennials for Spring 2019. SHELBURNE, VERMONT, USA, December 27, 2018 /EINPresswire.com/ — High Country Gardens has announced its top new perennials for Spring 2019. The new varieties include FlowerKisser™ After Midnight English Lavendar and a preplanned garden called the Fabulous Flowers and Foliage Shade Garden. The top new introductions—and hundreds of additional perennial favorites—are available at highcountrygardens.com. The 2019 Plant of the Year from High Country Gardens is FlowerKisser™ After Midnight English Lavender (Lavandula angustifolia WWG002). This exclusive introduction has stunning, dark-colored flower spikes with deep indigo-blue calyxes and large violet-purple flowers. 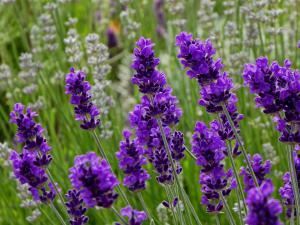 The color of the flowers is truly unique, and the plant stands apart from any other lavender available to gardeners. A medium-sized English lavender selection with gray-green foliage, After Midnight blooms in late spring/early summer and attracts bees and butterflies to its nectar-rich flowers. Plants in the new FlowerKisser™ brand have been selected by High Country Gardens’ chief horticulturist David Salman. These new perennial introductions are particularly nectar-rich and attract many pollinators, including honey bees, native bees, butterflies and hummingbirds. It thrives throughout USDA zones 5-9. The brilliant coral-pink flowers of FlowerKisser™ Coral-Pink Sage (Salvia greggii WWG003) color a waterwise garden from late spring to fall frost with a non-stop display. This plant grows as a medium sized woody shrub, and it loves a hot, sunny place where the soil dries out quickly. Hummingbirds adore its flowers, which never fail to provide them with a sweet meal. Trim this plant back in mid-spring by about 1/3 its height to stimulate new growth and another flush of gorgeous flowers. FlowerKisser™ Coral-Pink Sage thrives in zones 6-9. Available from highcountrygardens.com. Red Feathers (Echium amoenum) is a beautiful, xeric, small growing wildflower from the Caucasus Mountains of western Asia. Its russet-red flower spikes resemble Liatris. Blooming in late spring, this lovely plant will continue to produce new flower spikes throughout the summer when deadheaded. But leave some spikes on the plant later in the season to ripen seed. A short-lived perennial, Red Feathers should be mulched with gravel mulch to encourage it to re-seed itself. Adaptable to average, sandy and clay soils. Plant it in spots with a half day to a full day of sun. Pair this plant with Creeping Goldenaster (Heterotheca jonesii), Blue Flax (Linum) and Dark Violet Skullcap (Scutellaria). Grows in zones 3-9. Granita® Orange Cold Hardy Ice Plant (Delosperma Granita® Orange) blooms in mid- to late spring with a stunning display of large, pure-orange flowers. Granita Orange grows to form a tidy mat of ground-hugging evergreen foliage. It has proven to be a very cold hardy groundcover that fits well in a drought-tolerant garden. Granita Orange® Ice Plant grows in zones 5-9. FlowerKisser™ Arizona Beauty Coyote Mint (Monardella odoratissima FlowerKisser™ Arizona Beauty) has flowers and foliage with a very minty scent when brushed or handled. This sweetly scented native groundcover has lavender-pink puffball-shaped flowers that attract bees and butterflies. Normally this species is sub-alpine, but this lower elevation form (8,500 ft.) grows well at middle elevations throughout the western US. Plant it in a spot that gets some afternoon shade where day temperatures are hot. It grows well in zones 4-8. The Fabulous Flowers and Foliage Shade Garden is an easy-to-grow garden designed for planting in shade, dappled shade or morning sun. These perennials provide season-long interest with a pleasing combination of foliage types that provide contrasting textures and colors and a profusion of pink, yellow and white flowers. The garden grows well in most soil types (but avoid wet clay or water-logged soils). The Fabulous Flowers and Foliage Shade Garden is an excellent choice for planting on the shady north or northeast side of a house. The Fabulous Flowers and Foliage Shade Garden comes with a planting diagram, care instructions and 18 plants including: (5) plants each of Applachian Sedge (Carex appalachica) and White Nancy Deadnettle (Lamium 'White Nancy'), (3) plants each of Large Leafed Lambs Ear (Stachys byzantina 'Helen von Stein') and Weston Pink Coral Bells (Heuchera 'Weston Pink') and (2) plants of Golden Spur Columbine (Aquilegia chrysantha). The garden covers approximately 40 sq. ft. (8 ft. wide x 5 ft. deep). The garden grows well in zones 4-8. Flower Kisser™ Dark Shadows Sage (Salvia hybrid WWG001) is a color breakthrough in cold-hardy bush sages. It blooms with a profusion of hummingbird-attracting dark-purple flowers. A hybrid of Raspberry Delight® introduced by David Salman, it's a large, tall-growing woody sage that comes into color in late summer and flowers until frost. Flower Kisser® Dark Shadows is a good choice near walkways and paths. (When you brush against the foliage, it releases a delightfully sweet, herbal fragrance.) This sage makes an excellent companion plant for Blonde Ambition Blue Grama Grass (Boutleloua 'Blonde Ambition') and Dark Violet Skullcap (Scutellaria 'Dark Violet'). It grows well in USDA zones 5-9 and is available from www.highcountrygardens.com. Chumby Silky Rock Jasmine (Androsace sarmentosa 'Chumbyi') blooms in early summer with fragrant clusters of pink flowers held over fuzzy rosettes of gray-green foliage. Growing and spreading much like a strawberry plant, this compact little grower puts out red-stemmed runners that root to form a tidy mound. A cheerful member of the Primrose family, Chumby Silky Rock Jasmine is a wonderful small perennial for shady perennials borders. It also works great as an edging plant for shaded pathways. This easy-to-grow Himalayan native is a resilient performer that makes a good companion plant for other shade lovers such as Deep Blue Arizona Sage (Salvia arizonica) and Kashmir Sage (Phlomis cashmeriana). Chumby Silky Rock Jasmine stays small—just 2-4” tall and 8-12” wide in zones 3-8. For a complete look at all of the new plants for Spring 2019 available from High Country Gardens, visit www.highcountrygardens.com/plant-finder/new. Retailers must niche their keywords and phrases in their SEO and online advertising if they want to beat big companies with big budgets. SAN FRANCISCO , CALIFORNIA , UNITED STATES , December 27, 2018 /EINPresswire.com/ — Too many small retailers are suffering from FOMO (fear of missing out) and applying a shotgun approach to search engine optimisation (SEO) strategies, says one SEO expert. Director of Elemental Search Limited, George Weir, says spending time and effort on broad keywords like ‘hottest toys’ is counterproductive because not only is there high competition for those types of search queries, by high authority brands and online shopping websites, but the ‘consumer intention to purchase’ is likely to be low. He said a common reason why so many small mom-and-pop businesses go broad with keywords is for the simple reason of ‘popularity’ due to the significant number of monthly searches performed. “If you’re a small or medium sized toy retailer, it’s going to be difficult to compete with the big companies like Walmart and Amazon because they can afford to pour more resource, time and money into optimizing their website assets. “It’s a classic case of David and Goliath, so pick your stones and ready your sling” says Weir. A retailer who understands what’s hot and what’s trending will get more cut-through when they niche. “Websites with more relevant, useful and well-constructed web pages tend to rank better than those with fewer,” says Weir. Continuing the example of a toy store, Weir says that instead of just loading a web page with keyword phrases like ‘Num Noms Snackables Cereal,’ actually create an entire, content rich web page about the toy. “An entire page dedicated to the toy that ‘makes playing with food fun,’ is going to be helpful to parents as well because it’s likely parents represent a good chunk of those searching for the toys” says Weir. Weir says many small retailers are still missing out on capturing the names and email addresses of customers when they click online or visit the store. “Building a database of your customers for next Christmas is a no-brainer. Added to that, capture information about the ages of their children so that when those children are a year older come Christmas 2019, you can be more targeted with your marketing. “Point-of-sale software like Vend make this a no-brainer. The information is incredibly easy to capture and few customers ever decline, particularly if you’re offering incentives such as discounts or lucky prize draws,” says Weir. Finally, he advises, always write for humans in the first instance not search engines, ensure your content is comprehensive, relevant and fulfils the intention of the search – would the user browse elsewhere for more information? – keep in mind users who are more visual by considering imagery and video, always attempt to optimize for a good mobile experience, find web pages that generate ‘voice search’ results and look for clues on how you can apply similar methods to your content, and take the time to write good page titles and descriptions. Join Larise Kia and the Encino Chamber of Commerce as they present Bindupoint, a brand new meditation and yoga center in Encino, CA. ENCINO, CA, USA, December 26, 2018 /EINPresswire.com/ — Larise Kia will be hosting a ribbon cutting ceremony for her brand-new meditation center, Bindupoint. Located in the heart of Encino, Bindupoint will bring meditation and yoga into the lives of many. And what better time to find your center than right after the chaos of the holidays? Join Larise and the Encino Chamber of Commerce as they officially present Bindupoint to the public! The event will take place on Wednesday, January 9 at 12pm. It will be held at Bindupoint, 17547 Ventura Blvd #106, Encino, CA 91316. Hor d’oeuvres and refreshments to follow. There will be exclusive membership discounts available to those who attend as well as a chance to get to know some of Bindupoint’s amazing teachers. Bindupoint is a center dedicated to the illumination, nurturing, and development of one’s most inner being. Bindu is the source of cosmic potency. It is a point that we orient ourselves towards by learning stillness through guided meditation. Stillness nurtures our peaceful nature. It helps us to rejuvenate and integrate the restless and fragmented mind, promoting inner peace. For more information, please visit our website www.bindupoint.com or contact us at (818)616-4779. CSA Balloons, a leading North American custom printer, has revealed the top three upcoming custom balloon trends for the new year. Whether it is for a business event or a personal one, giant custom balloons are certainly going to be trending more so than ever in 2019. For business events such as trade fairs, these mega-sized promotional tools are great to help you stick out from the crowd of other business gathered there. They give a feeling of fun and energy to your enterprise. Not to mention, they look amazing on your business’s social media page. For personal events, giant personalized balloons elevate the mood and spread positivity. For gender reveal and name reveal parties, releasing a giant balloon out of a box in either pink or blue with the name of the baby on it is a popular trend. For weddings, large heart-shaped balloons with the name of the bride and the groom also are a tasteful and romantic accessory. For a birthday or graduation, giant balloons with your name on them are perfect for any photograph! Be it a corporate launch or an engagement party, a vibrant custom balloon garland ties everything together, making it sure to trend in the new year. At a business event, balloon garlands customized with your company’s unique branding and logo are a perfect way to create an important and professional experience for your guests. It shows the hard work your company has put in to the event to make it memorable and beneficial for all involved. At a personal event, balloon garlands made to your own liking are perfect to bring to life an occasion, and create a lovely event for all of your guests. Be it a wedding, a graduation or a birthday, balloon garlands are unique and out-of-the-ordinary, ideal for all purposes. Wow! An original and thoughtful idea to make sure that your event is remembered by your guests and yourself as being important and special … custom balloon ceilings. Who wouldn’t want to use these in 2019? 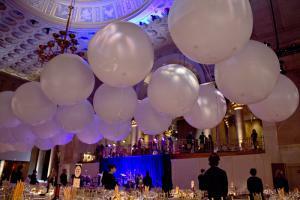 Companies can benefit from the distinct nature of custom balloon ceilings at conferences and business launches. Often, the people who attend these attend numerous throughout the course of the year. Having such an amazing marketing item used to represent your brand during such an event is a huge advantage to making sure that your business is remembered positively. Who better to take care of this responsibility for you than a qualified custom printer? 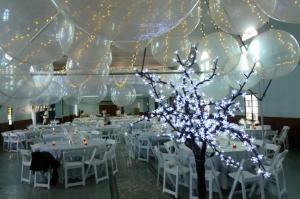 Everyone wants their party styled with a gorgeous personalized balloon ceiling. Impressing and wowing your guests is easy to do with these items. Fun and notable, they come in all kinds of different types from CSA Balloons. These three trends are certainly going to be in high demand come the new year. When it is time for you or your company to benefit from custom balloons, calling a professional custom printer with dedicated staff such as CSA Balloons is the way to go. Make sure that your event is just as exceptional as you imagined it to be, with CSA Balloons and these stunning new balloon trends. DALLAS, TX, UNITED STATES, December 26, 2018 /EINPresswire.com/ — Women are opting for more non-invasive non-surgical treatments to help with skin tightening for fine lines, wrinkles, sagging skin anywhere on the face and body ie. 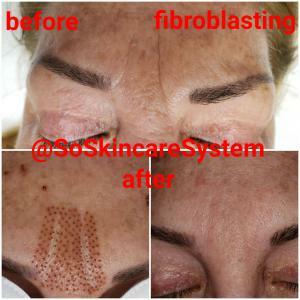 #11 furrow lines between eyebrows, neck, chest, arms, stretch marks, age spots or microblade strokes tattoo lightener. The solution is the newly released prestigious CE approved K85 Beierplasm Plasma Pen (K85) that uses an individual prepackaged sterile copper disposable probe available through the exclusive USA Distributor, So Skincare System (SOS). >Perfect auto mode launch button keeps released power spark 25 seconds for treatment. >Uses individual prepackaged disposable high quality copper probe that creates 0.06 mm micro trauma to skin. No bleeding. Spark is stable so there is no need to keep wiping off brown carbon matter during treatment. >Elegant ergonomical light body design keeps working 3~4 hours when the battery status is full and comes with a 5 year warranty. The K85 Beierplasm device is based on atmosphere pressure, plasma technology and the system combination of plasma high frequency and voltage. In other words, plasma flash is a heated ionized gas which is a fourth state matter with dynamic sine wave technology and elite engineering that creates a plasma flash. The probe tip doesn't touch the skin. The thermal skin disruption later causes excess skin to dry superficially into tiny crusts which fall off between 5-7 days. 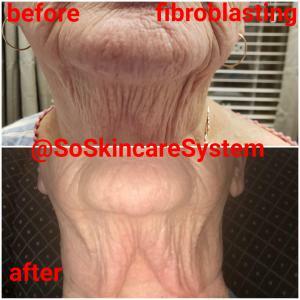 Fibroblasts start the process of collagen production which helps to reduce fine lines and wrinkles by inflating, plumping and lifting your skin. 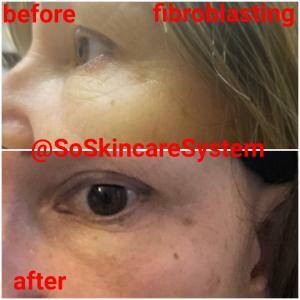 Beauty professionals are getting their K85 Beierplasm Certified Therapist certificates to add the fibroblast treatment to their service menu in order to stay competitive in the beauty industry.